The Right Hand of God Protecting the Faithful against the Demons,ca. 1452–1460. 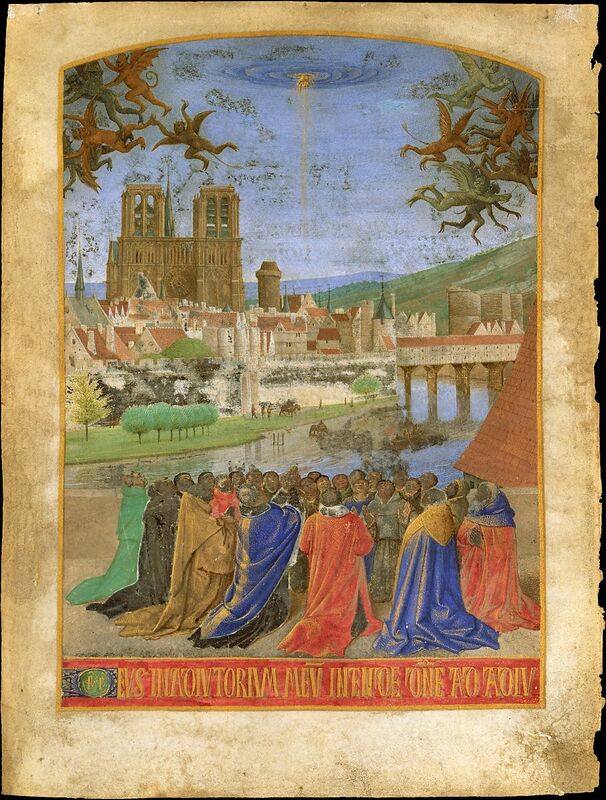 Jean Fouquet (French, Tours ca. 1425–ca. 1478 Tours). The Metropolitan Museum of Art, New York. Robert Lehman Collection, 1975. 1975.1.2490. The International Center of Medieval Art is dedicated to the study, understanding, and preservation of art and architecture produced primarily between ca. 300 CE and ca. 1500 CE. The ICMA was founded in France, and just prior to moving to New York, was headquartered in Paris. Read the ICMA’s response here. We are glad that so many of our members and medieval scholars are sharing expertise with news organizations around the globe covering the destruction of Notre-Dame de Paris. We would like to amass links to newspaper articles, radio and tv news stories, and blog posts in which our members are quoted or interviewed. We will post this collection on the ICMA website – sending out an e-blast when it becomes available, and adding to it over the coming weeks. Andrew Tallon, whose work will be vital in the reconstruction of the UNESCO World Heritage Site, helped form this organization. You can honor his work and help the cathedral by clicking here to donate. To learn more about the organization, click here. Support the ICMA’s mission of the study, understanding, and preservation of visual and material cultures produced in every corner of the medieval world. If you are interested in learning more about how to be of financial assistance to the medieval art community, please contact ICMA’s Executive Director, Ryan Frisinger, at icma@medievalart.org. The International Center of Medieval Art is a private, not-for-profit organization registered with the IRS as a 501 (c) (3) organization. Your contribution is tax-deductible as a charitable donation. The Medieval Academy of America has issued a call for expert documentation/information regarding the Cathedral or Gothic art and architecture in general, especially detailing any special resources that can aid in the restoration work (photographs, data, measurements, etc.). If you wish to contribute to this effort, please email Lisa Fagin Davis at the MAA (lfd@themedievalacademy.org), describing your expertise/materials. She will add your name to a list that will be forwarded to the relevant French authorities.